We all face problems and inconveniences every day of our lives. We get up late for work. We drop our favorite ice cream on the floor. We lose a parking spot to that the driver who just happened to appear at the exact same time we wanted that spot. Why do I call it a lion? It was used to be believed that a young boy (among some African tribes) had to kill a lion in order to be recognized as a man. A boy’s spent years practicing and preparing for that hunt. While you and I gladly don’t have to encounter that kind of rite of passage, I believe that we all encounter something that is similar. We all have one nagging problem that sticks with us no matter what. It could be lack of money, addictions, losing weight or finding love. We all have ONE problem that we feel is keeping us from happiness. I’d like to offer some perspective on that “lion”. When preparing to hunt a lion, it was crucial that one learn the appropropiate skills. You had to learn what a lion is, how to track it, and what to do when you find one. Similarly, when you deal with a big problem over and over again, you learn things. When you attempt yet another diet to lose weight, you learn things. When you start a business, you learn things. Even if those things crash and burn, you learn something that you didn’t before. Yet most of us are trained to see the mistakes, not the wisdom when we fail. We don’t look at the person we have become as a result of failure. Imagine that you survived an encounter with a lion in real life. Now imagine that you encounter a lion again. In that second encounter, do you worry about your failure to get out of the lion’s way? No. You use whatever knowledge you got from the first encounter and get the heck out of there! That is the same approach we need to have to our big failures in our lives. We need to look at what we have learned regardless of how we fail. Focusing too much on why we can’t seem to lose weight or why we can’t exercise or break that addiction only leads to a spiraling case of self-hate that takes us nowhere. If we look at what we learned (both the good and bad) in our failures, we can become stronger. 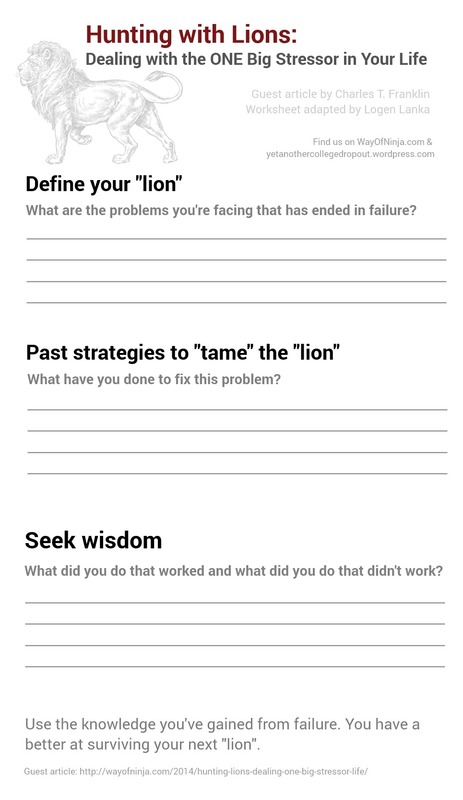 I invite you to take a few moments to write down the current problems you are facing right now that has ended in failure (your lion). Think about the ways you’ve tried to fix the problem. Think about the wisdom you gained. What things worked out? What things didn’t work out? Looking at it this way instead of focusing on the failure puts your brain in problem-solving mode, not “feeling sorry for yourself” mode. It’s OK to feel sorry for yourself, but if all of your energy is spent in that mode, you won’t learn anything. Going back to the African tribe scenario, imagine if the boy who hunted a lion gets injured. If he focuses only on that injury from an earlier encounter with a lion, he will freeze. If he uses the knowledge gained from that earlier encounter, he has a better shot at survival.. In short, everyone on this planet has issues. We also all have ONE big issue that we just wish would be solved once and for all, but keeps reappearing in our lives. Instead of focusing on the negativity of that failure, we should focus on the person we are becoming because of that failure. The boy who hunted the lion begins as a scared boy. He ends the journey as a wiser warrior.